WILMINGTON, N.C. – In the 1950s and 1960s, although the Black press was an important part of the Civil Rights movement, mainstream press outlets often depicted African Americans in a negative light, if at all. On Thursday, November 19, 2015 at 7 p.m. at Cape Fear Museum, hear how different local media outlets portrayed the Civil Rights movement then and now, and join a discussion of the media’s role in race relations. Rhonda Bellamy, executive director of The Arts Council of Wilmington and NHC, will moderate the panel discussion. This program is held in conjunction with For All the World to See: Visual Culture and the Struggle for Civil Rights, on exhibit through January 7, 2016. Through a compelling assortment of photographs, television clips, art posters, and other historic artifacts, For All the World to See traces how images and media disseminated to the American public transformed the modern civil rights movement and jolted Americans, both black and white, out of a state of denial or complacency. For All the World to See: Visual Culture and the Struggle for Civil Rights was curated by Dr. Maurice Berger, Research Professor, The Center for Art, Design, and Visual Culture, University of Maryland, Baltimore. It was co-organized by The Center for Art, Design, and Visual Culture and the National Museum of African-American History and Culture, Smithsonian Institution. For All the World to See has been made possible through NEH on the Road, a special initiative of the National Endowment for the Humanities (NEH). It has been adapted and is being toured by Mid-America Arts Alliance (M-AAA). 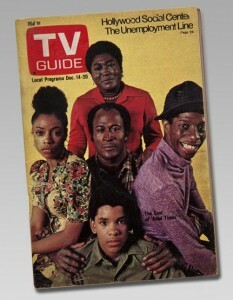 Photo: Good Times cast, TV Guide, December 14-20, 1974. From the NEH on the Road exhibition For All the World to See: Visual Culture and the Struggle for Civil Rights. 2011. Photo: E. G. Shempf.